Former two-term Colorado governor John Hickenlooper (D.) is likely to announce his presidential campaign on Thursday in Denver, according to the Colorado Sun. "The former Colorado governor received a permit to hold an event March 7 in the amphitheater at Civic Center park," according to records obtained by the outlet. "The disclosure comes a day after The Sun cited several sources close to the Democrat who said that he would announce a bid the first week of March." Colorado Politics has also reported that numerous "Democrats with knowledge of Hickenlooper's plans" have confirmed that the decision has been reached, and the campaign is a go. Hickenlooper has been traveling to Iowa and New Hampshire in recent months, and he has been fairly direct about his intentions. 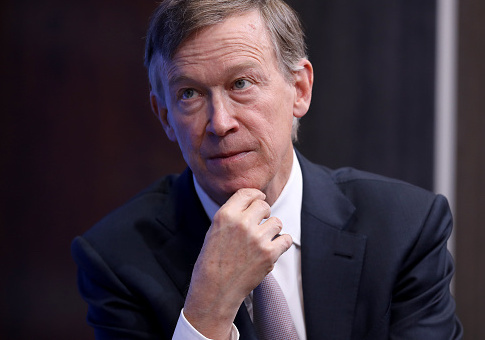 "I am governor of Colorado, I'm going to run for president," he said at a cafe last October in New Hampshire, though he later qualified those remarks. "To be honest, to be honest, I haven't made the final decision," said Hickenlooper. "And if I say I'm absolutely going to, then there are all kind of legal ramifications. So, let's say I'm leaning strongly." His leadership PAC also recently hired an Iowa "organizer," as the first-in-the-nation caucus is set to take place 11 months from now. The opportunity for Hickenlooper to become the first governor to jump in the race was stolen Friday when Washington's Jay Inslee, also a Democrat, announced his campaign. In his appearances at events in Iowa and New Hampshire, Hickenlooper has indicated he'll run as a moderate, at least as compared to the overall Democratic field comprised of candidates like Senators Elizabeth Warren (Mass. ), Kamala Harris (Calif.), Cory Booker (N.J.), and Vermont Independent Bernie Sanders. At a house party in Manchester on Valentine's Day, Hickenlooper often struck progressive notes only to scale those ideas back into a more moderate position. When asked about the Green New Deal being debated on Capitol Hill, Hickenlooper insisted that "the time for aggregate, you know, incremental improvement is past." But just moments later, he retreated into a deliberation on balancing the cost-effectiveness of some of the deal's proposals, all but implying incremental movement towards the program's execution. "I think, from what I've seen of the list, the different aspects and, and in the initiatives that are kind of collected in the green deal, the new green deal, are powerful, and useful. I think the key is to sit down and look [at] which one goes first. And which ones might go a little later, 'cause it is going to be a question of priorities. We're not going to have endless amounts of money," he said. His campaign is also expected to make an appeal to progressives on gun control issues, after the state implemented new laws in 2013 on background checks and a 15-round limit on the capacity of gun magazines. In the wake of that legislation, two democratic state senators were recalled, the first time ever a recall was successfully used on elected officials at that level of government.